I have Inflammatory Breast Cancer. It’s rare and it’s aggressive. That’s what I’m told by my surgeon on diagnosis. Indeed I am told that he rarely sees patients with this type of breast cancer. It is my good fortune that through an online support group on Facebook I have met two rather wonderful local women (we all become wonderful when we are diagnosed with cancer – I think it is a truth universally acknowledged) who are also being treated in his clinic for this disease. We probably wouldn’t have met if we hadn’t had cancer. Meeting other people with the same condition is a relief. It’s highly likely that the disease is all you have in common. But that’s enough when you are going through treatment. And with people you barely know you find you can pretty much discuss anything. Constipation, runny noses, coloured wee…all good topics for a meeting with one of these new friends as I sit in the sun at a small pavement café in Walthamstow Village. And yes we do have a village in Walthamstow, and yes it’s very expensive to live there. Phil and Kirsty have been spotted, as has Giles Coren. You get the picture. I don’t live in The Village. I don’t even live in what’s termed by estate agents as Village Borders. But I do like to visit. 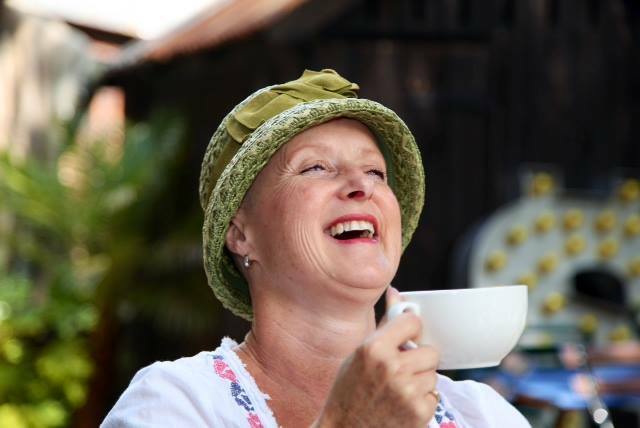 The Village boasts some nice cafes where I meet my Inflammatory Cancer mates and we sip tea and laugh uproariously about job insecurities when diagnosed with cancer, bowel movements, chemo-induced eye infections and other mastectomy related larks. I kid you not, there IS humour to be found in these topics with those in the know. On this particular day, as our teapot emptied and we wiped our eyes from laughing, my mate popped back inside the café to order a second pot. This was the moment when a woman sitting at the next table grabbed the opportunity to speak to me. “I think you are absolutely marvellous” she began. “I couldn’t help overhearing you and your friend talking and I think you are both very special ladies”. I wasn’t entirely sure how to reply. I don’t regard myself as particularly wonderful but I was reluctant to say so as I quite like a compliment and couldn’t really speak for my friend inside the café. For all I knew she had always known she was a wonderful person. So I didn’t reply and just smiled. It seemed the woman wasn’t seeking a reply in any case. “I do wish my Mother could have had your attitude. She was just so down and didn’t want to go out at all. She wasn’t as brave as you. It is so lovely to see you ladies laughing and having fun, being so brave. It makes me think of my Mum. She died”. I shook my head, laughed at the absurdity and bravely poured myself another cuppa.